These high quality adjustable microweave lanyards products are strong and sturdy. With a 3/8" wide strap they can easily be adjusted from 24" to 44" in length. Made from a tough as nails polyester material with a slide adjuster and wide "no-twist" plastic hook that keeps your ID from twisting, these adjustable lanyards are perfect for all uses. They are safe and strong; they can be used by children in school, church, or camp or by adults at work or socials. Plus, each adjustable lanyard comes with a breakaway clasp for added safety. Choose from three gorgeous available colors. 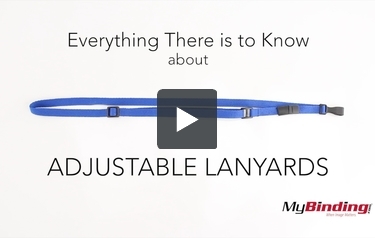 Lanyard Length: Up to 30"
This is Everything There is to Know About Adjustable Lanyards! First, they have a microweave pattern as seen here. Easily adjust them to various lengths as preferred by each wearer. As an extra safety precaution, they break away to prevent choking hazards. On the end is a plastic hook. And the width is 3/8 of an inch. There are many different colors to choose from.